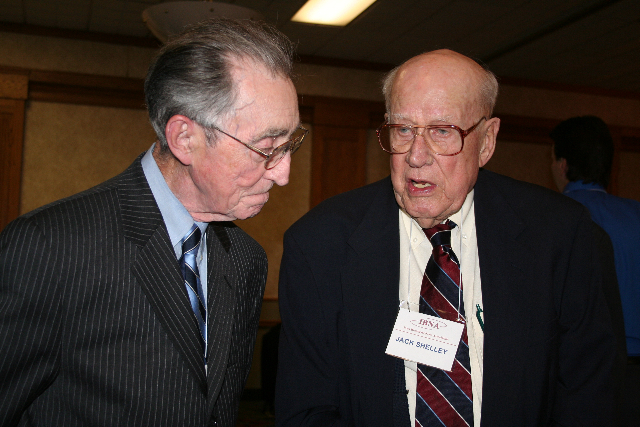 Grant Price (l) and Jack Shelley at the 2007 IBNA convention in Clear Lake, Iowa. Phil Roberts photo. 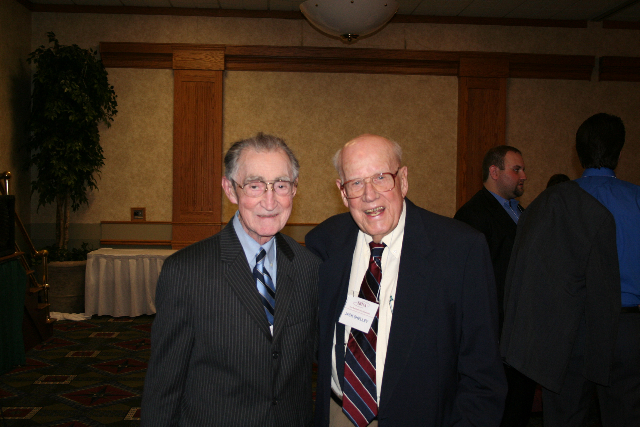 Grant Price (l) and Jack Shelley at the 2007 IBNA convention in Clear Lake, Iowa. They are no doubt discussing the news business. Phil Roberts photo. 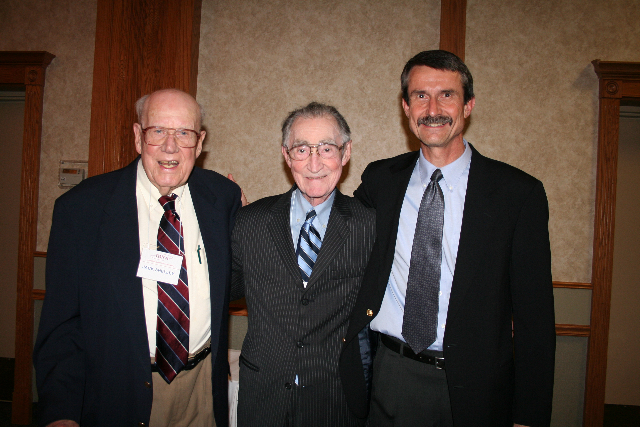 Shown l-r are 2007 Shelley Award winner Mark Minnick, WOC, Davenport; Jack Shelley; and Grant Price at the 2007 IBNA convention in Clear Lake, Iowa. Phil Roberts photo. 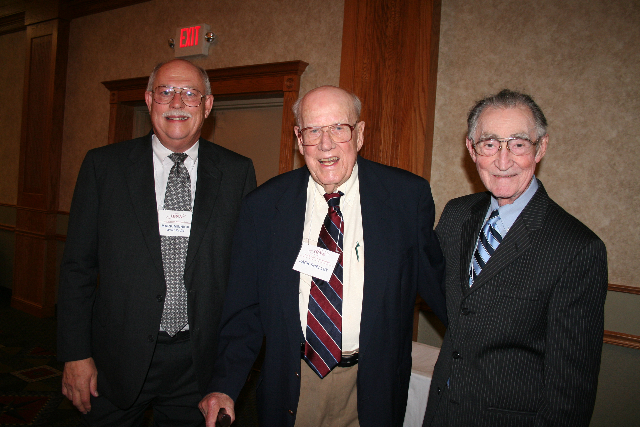 Left to right are Jack Shelley, Grant Price and Cliff Brockman, a former Shelley Award winner, at the 2007 IBNA convention in Clear Lake, Iowa. Phil Roberts photo. The following notification regarding the death of Jack Shelley is from Jeff Stein of the Iowa Broadcast News Association. Being a member of the IBNA gave me an opportunity to meet, hear and photograph Mr. Shelley, a true Iowa news pioneer, for several years at IBNA functions. A highlight for me was when Mr. Shelley himself presented the award named for him to my good friend and then boss Mark Minnick of WOC, Davenport, at our 2007 convention in Clear Lake, Iowa. May Mr. Shelley rest in peace. — Phil Roberts, Sept. 15, 2010. The Iowa Broadcast News Association joins thousands of journalists, former students, and those who remember his broadcasts in mourning the death today of legendary Iowa broadcaster Jack Shelley. Shelley died last night in Ames at the age of 98. Shelley joined the staff of WHO radio in Des Moines in 1935 after a short time as a reporter for the Clinton Herald. He became radio news director in 1940 and was one of the few local station reporters to do broadcasts from World War II. His reporting from both the European and Pacific Theaters during the war was not only treasured by listeners throughout the midwest for news of their sons fighting overseas, but was also carried by the NBC network and the BBC. He reported on the Battle of the Bulge and the Japanese surrender on the U.S.S. Missouri, and secured the first radio interviews with the crew of the Enola Gay after the first atomic bomb was dropped. In 1954, when WHO added television, Shelley assumed duties as news director of both radio and television. He was most known for his daily 12:30 p.m. radio newscasts, and anchoring the 10 p.m. television news. Shelley left daily broadcasting in 1965 to join the faculty of Iowa State University. He taught broadcast journalism to hundreds of students there until his retirement in 1982. He was a co-founder of what is now the Radio-Television Digital News Association, the leading international association of broadcast journalists, and was one of its first presidents. He co-founded what is now the Northwest Broadcast News Association, and also served a stint as executive director of the Iowa Broadcasters Association. “Jack Shelley not only wrote the book on broadcast journalism in Iowa and the nation, but his legacy challenged us to read the book, to understand the book and then follow the book to the letter,” said Brian Allen, current IBNA president. The IBNA’s lifetime achievement award was created and named for Shelley in 1972. He personally presented the honor all but four times, the most recent being in 2009 in Ames. Services details are not yet available. The Iowa Broadcast News Association offers its sincere sympathy to the Shelley family, and expresses its gratitude for the life of this most unique newsman. Can you give up technology for a while and focus? My how things have changed for many of us. The phone used to be a utilitarian device hanging on the wall or sitting on a desk, not an electronic gizmo in our pocket or hanging from our belt. If we wanted to listen to music, we either turned on the radio, played the phonograph or popped an 8-track tape (or later a cassette or CD) into a player. You didn’t have an iPod with pre-recorded music files on it. If we wanted to send somebody a note back in the dark ages, a pen, paper, stamp and envelope were required. There was no texting by cellular phone or e-mailing of messages. In many ways I think many of us are slaves to the technology that was created to make our lives easier. We feel naked if we don’t have our cell phone at our side. We check our e-mail often and feel that incoming messages require an immediate response. We choose hotels while on vacation not only for their cleanliness and cost, but based on whether or not they have free Internet service for our laptop computer. Did you ever wonder what it would be like to put away all the digital stuff for a while and take a vacation without it? 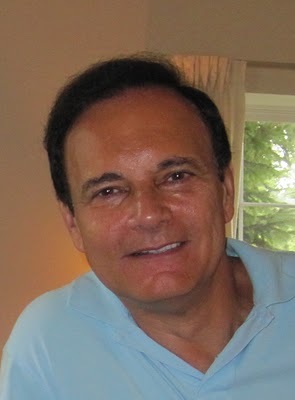 I subscribe to a free, daily, e-mail column called “Inside Music Media” (insidemusicmedia.blogspot.com) and written by Jerry Del Colliano, a broadcast and new media advisor, professor and broadcaster. As a former full-time radio newsman, I’m mainly interested in what he has to report about trends, good and bad, in radio. But he covers other interesting topics as well, including technology. Jerry Del Colliano recently wrote of a New York Times article that studied what happened when a group of five scientists spent a week in late May in a remote area of southern Utah, rafting the San Juan River, camping on its banks and hiking its canyons — without their mobile devices. Cell phones did not get a signal, and there was no Internet or e-mail access. I’m going to share some of Jerry’s column, with his permission. “This trip was an unscientific beginning to what I believe is going to be required research in the future on how heavy use of digital devices and other technology affects our brains,” Jerry writes. The scientists — some were believers and some were skeptics — wanted to know, writes Jerry, if heavy technology use inhibits deep thought and causes anxiety, and if getting away from being connected can help. “There is no doubt in my mind, after observing young students at USC, that depriving them of mobile connectivity causes extreme anxiety,” Jerry notes. “Young people often sleep with their phones, waking up to respond to text messages at times and then returning to sleep even if that sleep is of poor quality. Jerry points out that a study of the impact of heavy digital use on the brain is the focus of the National Institutes of Health, which now has a division to support studies of the parts of the brain involved with focus. As for the vacationing scientists in Utah, they experienced a form of withdrawal — “Third Day Syndrome” — that ended on their third day. “1. At least one scientist arrived at the conclusion that he may be turning to his cell phone in moments of boredom. You and I may experience the same thing. I am wearing out my pockets pulling my iPhone out and pushing it back in. Am I bored? Students told me they liked to hold their cell phones in their hands. Made them feel better — more connected as they could glance down for messages and respond in kind. “2. Sometimes the cell phone was used so the user could be anti-social. That’s interesting, as mobile devices allow us to be connected by Facebook and Twitter to other ‘friends’ who are not in our company. Could we be shortchanging those around us? “3. It was observed that clear thoughts were the benefit of getting away to enjoy nature without the use of digital devices. “4. One scientist said he could now understand why teenagers decided to text while driving, even putting themselves and others in danger. “5. Maybe digital stimulation leads to poor decision-making. Ever since I have owned my iPad and used it to read books at night, I have been getting lousy sleep. I Googled the phenomenon to find that others are having the same problem. Turns out the light emitted from the brilliant iPad screen, even at the lowest settings, disrupts sleep patterns. I went cold turkey for two weeks with better results. Now I ordered a Kindle for late night reading, as much as I like the iPad better. Kindle digital ‘paper’ does not produce the overstimulation of the iPad. Jerry writes that, in the end, consumers will have to learn to manage their digital lives better than they do now. He’s right, of course. Now excuse me while I go and check my e-mail. Copyright 2010 by Phil Roberts, Creative Enterprises. This was submitted as a column to “The North Scott Press,” Eldridge, Iowa.